ColecoVision.dk Homebrew Section Presents: Jean-François Dupuis. CollectorVision is based in Canada. Jean do not make games himself, but outsourcing it to others. He sets an order to make a given game from the previous MSX or Sega SG-1000 platform, which then ported back to ColecoVision. But game developers are also contacting J-F to get their games published. Moreover, he is also involved in the manufacturing of boxes and manuals to the many games on the market. He and his friend Tobie folds their own boxes, glue them and puts even the labels on the cartridge. 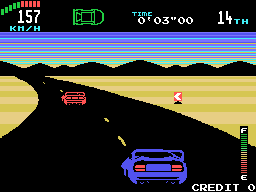 Also in 2012 will he be involved together with Teram Pixelboy in making cartridge shells for ColecoVision. They used a mold from Opcode Games, but it was saying that Jean has made a mold to be used in the manufacturing of cartridges in all colors and transperent. There will probably also involve sales of cartridge shells to other interested. So making games is a hard work. 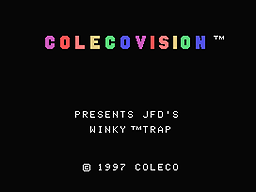 Jeans first work on ColecoVision was a hacked version on Mouse trap he called Winky Trap. Some (Maybe John Dondzila.) had in 1997 taken Winky from the Venture, and replaced it with the Mouse in Mouse trap. All other characters was changed and taken from the game Venture. The story is that only 5 games were produced and they all sold over 200$ each. With the profits, decided Jean to start his own publishing label, namely, CollectorVision Games. CollectorVision Games was founded in 2008. 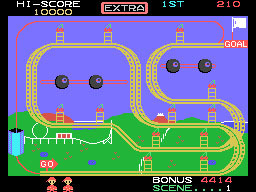 And his first game released under the CollectorVision label was Mr. Chin. Some of the games released for ColecoVision via CollectorVision: Mr. Chin, Mario Brothers and Penguin Land. 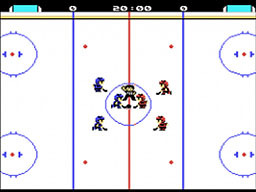 Coleco Rod Hockey based on NES, and a nice version of Mr. Do's Wild ride. Mr. Do's Wild Ride should have been a joint-venture game between Jean and Luc Miron from Team Pixelboy. Latest news about Mr. Do's Wildride says Jess Ragan now is the programmer for the game. Both games above is long-term projects, and therefore there is no set time limit yet. Whether they still are together on these projects is unknown. Zippy Race Pyramid Warp Battle Ship Clapton II. François has also other plans, he has designed a joystick to be able to stand on a table. The picture below is a computer made prototype. As you see, it have a Arcade joystick, 2 fire buttons and a keypad. François would like to extend its joysticks to include a whole Colecovision board inside. This will be a complete solution and a plug and play product. This photoshopped version is not the final design. This is a prototype Mario Brothers Controller Edition from CollectorVision showed in 2011. 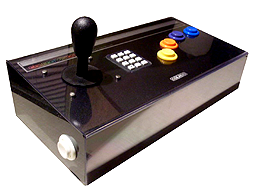 This is the final prototype from 2012, made in acryl, with number pad, arcade buttons and 2 for pinball games. There was made 30, and all 30 was sold out in record time. CollectorVision have also a plan for a model with a ColecoVision video game console inside. Whether it comes true is not known. 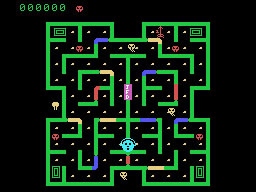 François do also work on these two ColecoVision games below. Super Turbo Racing Legend Of Zelda. Those games are among many long-term projects, and therefore there is no set time limit yet. Probably for his own WaferCart, and whether they are optimized for the Super Game Module or even CV 2 is not known. So you want to be a Knight. Donkey Kong 3, Montezuma's Return, Monster Bash, Rip Cord and Bagman. Jean-François Dupuis is the founder and project leader of CollectorVision Games.